We’d love your help. Let us know what’s wrong with this preview of Exploring ES6 by Axel Rauschmayer. 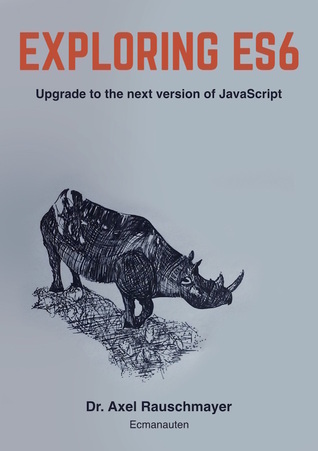 To ask other readers questions about Exploring ES6, please sign up. Really good ES6 book, author answers a lot of "why" questions the reader might ask. Chapters are fully independent and can be used as a reference. Most of those books are dry and very technical but this one is pretty easy to read and understand. Good overview of ES6. I like using it like a handbook. Dr @rauschma, always great in his teaching! Great content, but the writing style is a bit tedious and repetitive. That said you really can't ask for more detail, and there are some nice practical examples, i.e. in the section on proxies. Very in-depth overview of ES6. I really like the writing style, full with easy-to-grasp examples and use cases. I lati negativi però sono diversi. Innanzitutto a volte sembra scritto al contrario. Inizia descrivendo una caratteristica a livello talmente astratto da non capire di cosa parla, per poi passare ai problemi nell'implementazione, quindi all'implementazione a basso livello, e finalmente spiega di cosa si tratta e come si usa. Le spiegazioni troppo spesso sono noiose frasi di 2-3 righe che non dicono niente che il nome della funzione non dica già. Gli esempi sono pochi, risicati e spesso troppo astratti. Even if it's still in progress, most likely it's the best resource on ES6 you can get. Rich, deep (sometimes goes even a bit over the edge) while still very approachable. Keeping in mind its size, I was surprised that it covers only the new elements of ES6, not whole ESx since the beginning of humanity ... Very helpful & highly recommended for people interested in modern Web. approach. First is described feature and base use. Then some practical use examples. API details and last a deeper look into implementation details, reasons, and possible problems. I definitely recommend this book for every who want know JS language. Good: free online and sufficiently detailed.